Assam Minister for Hills Area Development (HAD) and Bharatiya Janata Party’s Diphu legislator Sum Ronghang asked the BJP workers in Dima Hasao district to get prepared for the election to the North Cachar Hills Autonomous Council (NCHAC) during an opening ceremony of the newly constructed Circuit House at Maibang in Dima Hasao on Sunday. Speaking on the occasion, the former chief executive member of NCHAC, Sum Ronghang condemned the mob lynching incident that occurred at Panjuri village under Dokmoka Police Station in Karbi Anglong on June 8, 2018, where two youths namely Nilotpal Das and Abhijit Nath were lynched to death. Talking to the media, Ronghang said that the Government would take necessary steps to release the salaries of the normal employees of the NCHAC. 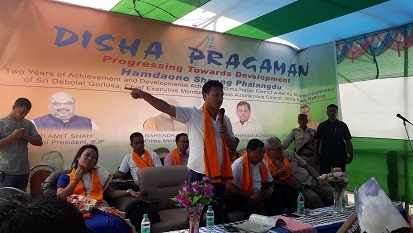 It may be mentioned that Ronghang visited the district for the first time after taking charge as minister in the expanded Sarbananda Sonowal ministry. ‘Dima Hasao Bubli’ was also unveiled during the programme. NCHAC CEM Gorlosa, chairperson Ranu Langthasa, BJP’s Haflong MLA Bir Bhadra Hagjer and NCHAC executive member Lungsing Teron were present in the opening ceremony of the circuit house.